New figures show the west country's ambulance service dealt with a 38 per cent rise in the number of emergency calls over Christmas. 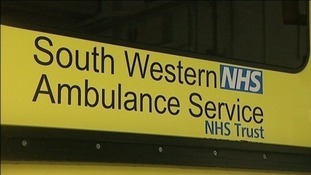 The South Western Ambulance Service was on the verge of declaring a "major incident" last weekend as they struggled to keep up with demand. Last Saturday alone it dealt with 3,205 incidents calls to its 111 and 999 numbers - that's 883 more than on the same Saturday in 2013. The service say they will review planning for the festive period. With warnings that the South Western Ambulance Service is under enormous pressure - especially over the Christmas period - we asked about your experiences with emergency health services in your area. The response has been mainly positive, with overwhelming support for health workers themselves, though some are concerned that the service is overstretched. Here is a selection of your thoughts. Had to call 111 on Christmas morning for my daughter, which resulted in a trip to the children's A&E department. We were seen very quickly, and a fantastic service was provided by both 111 and Bristol Children's Hospital. Couldn't fault it in any way, and we managed to get home for Christmas dinner (at 7pm!). Our NHS is being run into the ground. It needs a massive cash injection from the government. The poor staff are worked to death. It's not fair. They do the best they can given their situation. I have never had a problem with their service because I am grateful for it. Had to dial 999 yesterday, paramedic came within minutes! Fab service. I have been to five head injuries in the past year and Gloucestershire has outdone itself. A wait of over one hour and 40 minutes for an ambulance to transfer a critically injured person after a life-threatening accident ... I could drive to London in that time! The accident happened in South Cerney. Not the middle of nowhere. My friend remained unconscious and passed later that day. Highly disappointing and contemplating if this were to happen again, I would risk driving the injured person to the hospital myself rather that letting them die at the side of a cold road. It would help if doctors' surgeries were open longer hours over more days to alleviate the problem of an already overstretched A&E. There's a warning that emergency services in the West are close to breaking point. The 999 service dealt with a record number of calls this weekend, with more than 3,500 on Saturday alone. The 111 service was also swamped with calls. Police cars were even being used to take people to hospital. Just how urgent is your emergency? Gloucestershire Care Services NHS Trust has revealed that people contacting its out-of-hours services have a funny idea of emergencies. It comes as South Western Ambulance received an unprecedented number of calls over the weekend, putting the service under incredible pressure. It says the following were among the top five reasons for people asking for help over the holiday. Surely a pharmacist could have helped or these issues could have waited until GP surgeries re-opened? If nothing is done, the problem "will reoccur"
I have already asked Health Ministers to make sure that the Ambulance Trust is receiving all of the help it deserves in dealing with the unprecedented demand during the last four days, while 'in hours' GP surgeries and other non-urgent medical services have been unavailable. Once this immediate crisis is over I will be urging Health Chiefs and Ministers to reflect on the trends which are contributing to these pressures. Poor integration of and inadequately of capacity in out of hours services; the closure of almost 50% of acute beds during the past decade leading to intolerable pressures at A&E; a culture which now points to emergency services as a 'first' rather than as a 'last' resort; and the weakening of the capacity of Ambulance services as the easy and more profitable parts of its service have been parcelled up for privatisation, have all contributed to the problems and pressures on the service. These must be looked at when we have the luxury of more reflective time, as we know that otherwise this problem will reoccur not only at every future Christmas and Easter but at other times. I also have some sympathy for the views of the College of Emergency Medicine about those who expect our already overstretched emergency services to mop up the self-inflicted problems of over-indulgence in alcohol. Perhaps they're right and we should consider how to make sure that people take more responsibility for their behaviour? The South Western Ambulance Service which covers Bristol, Gloucestershire, Wiltshire, Somerset, Devon and Cornwall says that it is on the verge of declaring a internal 'major incident'. The average number of calls 999 takes from this area is 2,500 a day. Yesterday they took 3,500 calls. Steve White, says the 111 service is overwhelmed and that the police force are being used to provide health care cover. Please only call 999 and 111 for life-threatening emergencies and urgent medical help. All NHS services, including 999 and NHS111, are experiencing extremely high demand today. If you are suffering a life-threatening emergency or need urgent medical help then please call. However, if not, please think about the other healthcare options available, such as self-care or visiting a pharmacy, or please consider whether your problem could wait until your own GP surgery reopens on Monday.